The Michigan-based indie fragrance line Kerosene released Unknown Pleasures in 2013. I first read about this fragrance with mixed emotions. The notes sounded appealing — Earl Grey tea, lemon, bergamot, honeycomb, tonka bean, caramel, vanilla and waffle cone. On the other hand — could it really be an homage to an iconic album by British post-punk group Joy Division? Yes, apparently: Kerosene's product description continues, "You're walking down a cold street in Manchester, listening to Joy Division, sipping on a warm cup of London Fog..."
For two years I've postponed trying this fragrance, partly because Kerosene isn't widely available, and partly because I'm always hesitant to try anything inspired by a favorite work of art. Unknown Pleasures was integral to my college years and twenties, playing on steady rotation in my various dorm rooms and apartments (all decorated with a large poster of Joy Division frontman Ian Curtis). I love everything the band recorded (not nearly enough, alas), but this album is my favorite and remains one of my "desert island discs." So, now that I've finally worked up the nerve to try Kerosene's fragrance, what do I think? Short review: this Unknown Pleasures isn't something that I can imagine Ian Curtis or any of his bandmates wearing, but I like it. Like Kerosene's Unforsaken, Unknown Pleasures is a unisex gourmand with citrus notes: it starts off with a very tart lemon that segues into tangy-sweet bergamot. There's also a thread of something mildly spicy running through this citrus phase; I'm reminded of cardamom, perhaps. Unknown Pleasures is definitely a gourmand, yet it isn't overly sweet; the honey is balanced by a bite of ginger, and the tonka and caramel are creamy yet earthy. London Fog is a beverage made of Earl Grey tea blended with hot milk and vanilla flavoring, and the sense of smoky, bitter black tea beneath softer, warmer flavors is nicely captured here. Unknown Pleasures is linear after its first hour or so. It has excellent staying power on my skin. As I said above, I can't imagine any member of Joy Division wearing a fragrance like this one — their post-industrial aesthetic might be evoked better by something from Blackbird or Andrea Maack — but I'd wear it myself, on a rainy day when I want to curl up with a book, a snack, and an album that has become comforting through its very familiarity. Kerosene Unknown Pleasures is available as 100 ml ($140) Eau de Parfum. For buying information, see the listing for Kerosene under Perfume Houses. 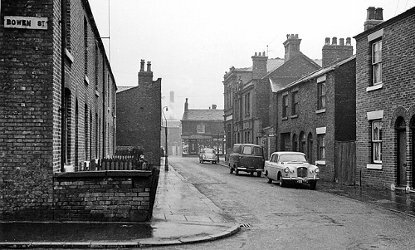 Note: top image is Side street off Bower St., between Miles Platting and Newton Heath, Manchester [cropped] via Wikimedia Commons. Ooooh, it sounds like a must-try for me. I assumed London fog was just London fog, I didn’t know it was yummy tea :). You make it sound very appealing. Ajda, I had to look up “London Fog” — to me, it usually means the classic raincoat brand — obviously not right in this context! This sounds almost like a chai latte, but less spicy. Also, I wanted to ask if you have you seen Control? I remember loving it, but I’m not a devoted Joy Division fan like you. Yes! I loved it, too. It seemed like a very thoughtful treatment of the “real life” story. Visually striking (of course! Anton Corbijn!) and a great cast, too. I loved Control too. Such great film. I don’t think this drink has made its way to the NYC area yet! Something to look forward to. I love this perfume but like you said, I can’t imagine the connection to the band. It’s definitely a rainy day on the couch perfume. I agree! It doesn’t evoke their music or their image — but since this album is now an old favorite of mine, and one that I listen to when I’m alone and safe, it ends up fitting in a weird way. This is probably my favorite Kerosene- so creative! But it does make me wish that Kerosene did smaller bottles- not that I ever get through 100 ml of anything, but I would REALLY never get through 100 ml of earl grey and waffle cone. Oh, me too! If there were a 30 ml or 50 ml option, I probably would have ordered it already. Yep. Neither Kerosene’s Unknown Pleasures nor DS & Durga’s Debaser evokes the spirit of the band inspiring its name. They’re pleasant enough, I guess, but I imagine Ian Curtis wearing a more industrial version of SL’s De Profundis, and Black Francis… oh heck… something leather and spice and everything nice because why not. I still haven’t tried Debaser, partly for a similar reason — the memories of my first Pixies show and first Pixies album are still too intense and connected to a certain time in my life, and anyway, I imagine the Pixies smelling like sweat and rusty metal — not like figs. I have probably sampled this at MIN but don’t remember it. I have a sample lying around somewhere and now want to try it agin – you made it sound very appealing! P.S. Fancy seeing you and your hubby at th train station! It was so out of context. Yes!! That was a strange and very nice surprise! Funny timing. I did end up resolving the situation of my misplaced ID and other personal items — my own fault for being forgetful. And we made our train after all. It sounds more like a tribute to London but I can’t see the connection to the story of this iconic band. Of course I’ve never seen the band live, but if Peter Hook(their bassist and also from New Order) is ever playing where you live, it will be the closest you will come to having that experience. He played the entire Unknown Pleasures albumat one show here in NYC. It was a spiritual experience. You know, I thought about going to that show — apparently it’s a bit of a controversy, P Hook doing the album out on his own?! — and on one hand, I would have loved to be there, and on the other, I always listen to JD alone and I would feel so strange being in a room full of people! Maybe it will be released on DVD someday. I was right with you until you wrote “yet it isn’t overly sweet”… EGAD! It’s one of the very sweetest fragrances I know. I like it, actually, but find it just too tooth-aching for regular wear. As far as gourmands, I found Kerosene Unforsaken much more perfumista-friendly.